Once again, a large part of our very enjoyable school time has been spent doing the Truth in Tinsel advent activities. 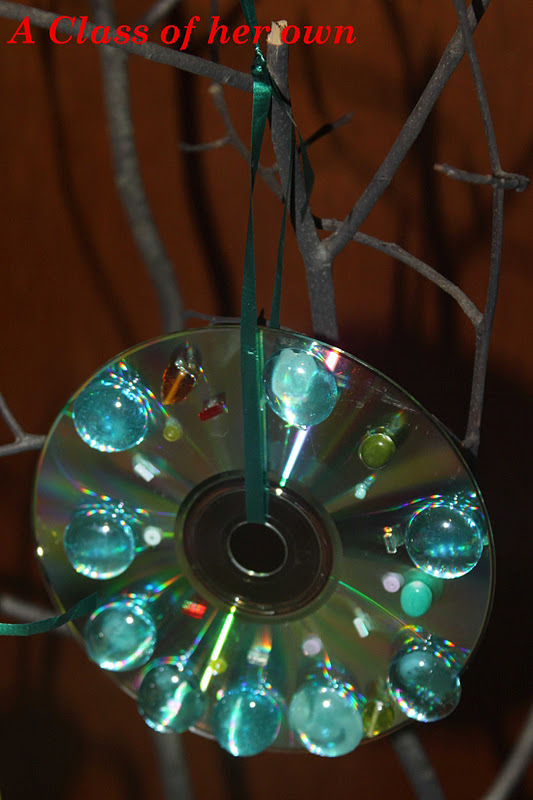 On Day 5 – Cricket made her Mary Ornament. She was very particular about Mary’s clothing and REALLY enjoyed making this one. On Day 6 – Cricket got to waterpaint these images for Elizabeth and Mary. I loved that she was able to make this independently and that she got so much out of the message. When we finished them, she wanted Elizabeth and Mary holding hands since they were so close. On Day 7 – Cricket loved learning about Mary’s song. Cricket is all about expressing herself through song so she really got into this lesson. While she was making her ornament we enjoyed some Veggie Tales Christmas tunes. On Day 8 – We discussed the birth of John the Baptist and the foretelling of the birth of Jesus. Part of the lesson was Zechariah referring to Jesus as the Rising Sun, hence our sun ornament. Cricket adored this glitter paper. On Day 9 – Cricket made a Joseph ornament, and once I was able to convince her that Joseph would have been wearing a robe (and not pants) she was very specific about how to decorate him. He absolutely had to have a beard, like the ones that we saw when I was convincing her he should have a robe. On Day 10 – We talked all about how Joseph’s visit with an angel was different than Zechariah and Mary. It was different because Joseph was visited in a dream. Cricket really seemed to get into this discussion, but she wasn’t very into the pillow ornament. On Day 11- We focused on the importance and meaning of Jesus’ name. Instead of doing a collage we wrote Jesus’ name largely, and surrounded it by the names of all of our friends. In addition to Truth in Tinsel we have been marking items off of our Christmas To Do List. 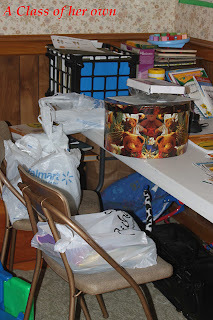 This week we managed to read the Nativity story and set ours up, send a package to a loved one, and make fudge. Cricket and I do a modified version of our normal school week during December. 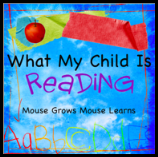 We still do a lot of reading and other “normal” activities everything is just Christmas themed. The only thing we have continued from our traditional school week so far is her Horizon math work. 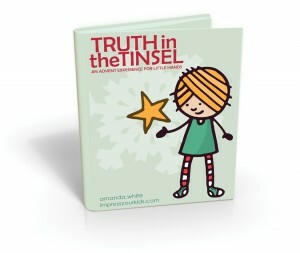 A large part of our very enjoyable school time has been spent doing the Truth in Tinsel advent activities. Luckily we started on Monday to get ahead a little, since I already got sick and we missed two days at the end of the week. You know what they say about the best laid plans! Cricket has loved these lessons though and making the ornaments has really brought everything home. On Day 1 – We made a Candle for Jesus “The Light of the World”. Cricket was telling her Daddy about this lesson and the names of Jesus that night, and said “but Daddy his real name is Jesus”. Cuteness. On Day 2 – Cricket chose to mix red and blue to make purplish paint for our crown, and she added glitter instead of sequins or gems. She still wasn’t so sure about the other names of Jesus. On Day 3 – We made Zechariah, and I think this was Cricket’s favorite thus far. While this isn’t a “cute ornament” I would want to keep, it REALLY sunk in the story. She loved popping the bubble on Zechariah’s mouth! Once again, I highly recommend that you pick up a copy if you haven’t already. You can see how much everyone is loving it here on the Facebook page. I’ve really enjoyed seeing what everyone has done. We started with decorating and these are a few pictures of Cricket’s room. Her Nativity has been one of my favorite purchases for her, just this year she has already played with it for several hours (in context). She really loved making the Borax Snowflake Crystals. We must have checked in on them over a dozen times in the day that it was forming. I think I let her make this a little too big, it was hard to get out of the jar, but we will definitely be doing this simple activity again. Cricket and I also worked together on the Felt Tree for her school room. She had very specific instructions on the ornaments and wanted to embellish them herself. We also marked buy presents, make a present for someone, and have a movie night off of our list. Oh, and for a little bit a realism this is how our school room looked on Monday and why we did our day 1 project at her lap desk.